SWAGDAY! - Win A Copy of the Tales of the City: 20th. Anniversary Edition DVD! Home/Featured/SWAGDAY! – Win A Copy of the Tales of the City: 20th. Anniversary Edition DVD! HAPPY 20th. ANNIVERSARY MRS. MADRIGAL AND 28 BARBURY LANE! In co-operation with ACORN Entertainment, Back2Stonewall has TWO copies od the Peabody Award-winning PBS miniseries, Tales of the City: 20th. Anniversary Edition to giveaway! 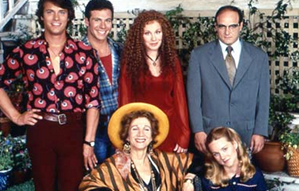 Based on the groundbreaking novel by Armistead Maupin, Tales of the City follows a colorful cast of characters living at 28 Barbary Lane in anything-goes 1970s San Francisco. The all-star cast includes Oscar® winner Olympia Dukakis , Oscar® nominee Laura Linney, Gemini winner Paul Gross, Billy Campbell, Chloe Webb, and Thomas Gibson. The NEW DVD 2-DISC SET includes all six episodes, plus bonus audio commentaries with the writer, director, and stars Olympia Dukakis, Laura Linney, and Barbara Garrick, 36-min. of behind-the-scenes location and rehearsal footage, insert with an introduction by Armistead Maupin, notes by producer Alan Poul, and filming locations and landmarks and MORE. So drop me an email at Will@Back2Stonewall.com and I’ll pick 2 winners at random to recieve this landmark series DVD. Giveaway SWAGDAY Tales of the City.